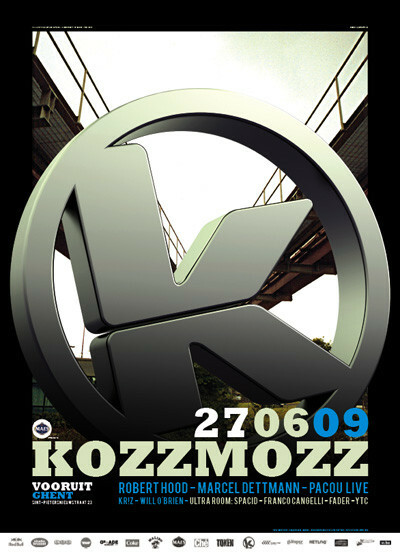 For the summer edition of Kozzmozz we have invited some special guests again and we can guarantee you, it?s going to be one hell of a party again also! Our first international star is Robert Hood also known as a founding member of the legendary collective Underground Resistance. With his latest album ?Wire to wire? he takes us to another level of musicality and sophistication within the world of electronic music. His latest project ?Hoodmusic? on Music Man Records brings a unique style of minimal techno back to the forefront and are singles leading up to an album. Around the time of this party a special ?white vinyl? version of the classic: ?Minimal Nation? featuring unreleased music from the original recording sessions will also announce the re-birth of his own label M-Plant. As second international guest we welcome Marcel Dettmann. He is resident of the famous and well-known German techno club, Berghain in Berlin for whom he also mixed their second compilation. Next to remixes for the likes of Ellen Allien, he also started his own label Marcel Dettmann Records on which he has released several of his own productions and some remixes. Marcel Dettmann is definitely on his way to the top with his exciting and refreshing look on current techno. To end our international line-up we?ve invited a fellow countryman from Germany, Pacou. His main release was the experimental techno style LP "No computer involved" on Tresor. The newest project of Pacou is the vinyl label "Cache Records" on which he has steadily been bringing out records since 2005 with the latest one being the popular ?Tangent? release. He recently also named one of his tracks on the Special Operations EP on the Mental Disorder label ?Kozzmozz? so it was impossible to resist booking him again. They are joined by Will O?Brien from Sub-Scape, a high quality techno concept in Café Capital in Antwerp, and our resident Kr!z who?s going strong with his label Token Records. Kr!z has been taking Token on the road with Token label nights in Shangai, London, Berlin, Rotterdam, ? He has released 11 records in less then two years from artists such as Inigo Kennedy, Phase, Radial, Dimitri Andreas, Oscar Mulero and more. For those who like their techno sounds in the style of Dettmann, we have added the Ultra concept to the festivities again. They will be brought to you by the better Belgian dj?s as well as a young talent. If you want to play in the Ultra room at Kozzmozz, post your demo?s on www.vi.be from Poppunt before June 7th. Our resident Spacid will bring his collection of minimal records and as you know, when he?s behind the decks, all hands will go up in the air! Franco Cangelli will also play in his hometown and has released records on labels such as ToysforBoys, Sushitech, Seventh Sign, ? whilst also running the Aesthetik and Nowar labels with Akî and his own techno label Mowar. Fader who works at NEWS takes care of labels such as Music man and Eskimo. It?s also the place from where he runs his own label Curle Recordings of which several tracks have been compiled by Sven Väth & Richie Hawtin. Perfect for the Ultra room we thought!